What if a pill could make you rich and powerful? I found an interesting package in my mail today, wrongly addressed to "Alexis" (not Alex) Billington, but that didn't matter. Inside was a brochure and sample of NZT pills - short for "thallanylzirconio-methyl-tetrahydro-triazatriphenylene" - also called the "clear pill" that Bradley Cooper talked about in a recent viral video from earlier this week. Wait - they want us to take one of these things? Even the back of the package is creepy, containing warnings saying: "Once you have started taking NZT, it is vitally important that you finish the regimen." I think I need a test subject to try them out! 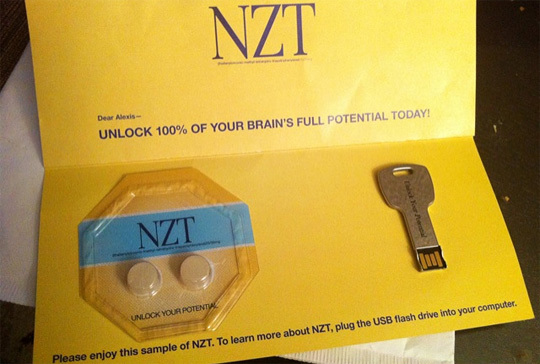 The letter was mostly a sales pitch stating things like "unlock 100% of your brain's full potential today" and "it will literally change your life!" Now you know why I'm nervous about trying these pills. I'm also amused by the part that says "talk to you doctor about NZT." What if real doctors start getting real inquiries about this "miracle drug"? There is also a USB drive that contains a copy of the Bradley Cooper promo video, but nothing else. Don't forget you can actually call 1-855-CLEAR-PILL or visit the site: theclearpill.com. It looks like they're kicking off marketing for Limitless with a big viral campaign and that's what I love to see. I'm looking forward to following this and seeing what unfolds next with these NZT pills. Should I try them? don't you have an intern to test for these first? Go for it. What's the worst that could happen? You unlock 100% of your brain's full potential? Thought so. Eat them pills ya sissy! Mass murdering blackouts aren't that big of a deal, I'd totally do it if I were in your shoes!!! 😉 It's probly sugar candy anyway. What's the worst that could happen? Try it! LOL, "discontinued﻿ use will result in death"
Ok Alex, come one tell us how to get one of those packages? Also, hell yes I would take them!! Send them to me!! How can we get one??? instant wealth and power! GO FOR IT! He's too busy solving the world's greatest problems right now to tell us what happened. In between serial killing sprees. hellz yeah, how can i get some of thesee? 1 question, how do i get one of those? It's just some candy of sorts. Anyone who thinks otherwise would really need one for real 🙂 Granted one can always wish.. but yeah. Just marketing. Cool marketing. If you think this is real, you're stupid. It's just a big promotion for the movie. Get a life. I think you meant "you're" stupid. Comprehension and patience is key. Key. Key. I think you should try a pill and post it on youtube... You will be viewed all over the world. Try the 2 pills and record your experience... That alone should make you a hero. If you don't like that idea, pay a bum or something... idk... good luck with a decision. every since i've seen this movie.....i've been telling everyone...i need this drug!! man i wish it was REAL!!!!! GREAT MOVIE TOO!! how can i get some to tried????? You can check out NTZ.1, which is as close as it gets. The NTZ.48 from the movie is not real, but NTZ.1 exists and it does a pretty good job. I agree that it's just one of the movie Limitless marketing strategies. I think what it says there on the brochure is also all about fiction. Look, if u haven't tried them already - DON'T EVER! The whole "10% usage" is a common Hollywood myth. We use 100% of our brain at any time. It can, probably increase a level of ur neurotransmitters and oxygen when crossing the blood-brain barrier, or it can affect the corpus callosum... Although, if you really need a substance of that kind, I suggest you try Piracetam. Like for reals... if they were real, I'd try one. If it's candy, they're legally obligated to put some sort of nutrition label on there, so I dunno. Take it to a lab to be processed, and see what happens, haha! I wish this drug was real. You have nooooo idea. What did the usb thing say then? Y ea you could take 1 pill and use 100% of your brain, or you could take 10 pills and unlock 1000% percent of your brain! Paneuromix pill is what you are looking for. Google it and you'll see. You cant die, because if you do get sick, u can sue! these are really menthol mints. i got the same thing. The movie is just a movie. Of course, but there have been some advancements on this field of nootropics. If you need something like this, you should google Paneuromix. It's NZT.1 and it is as close as it gets to what you are talking about here.